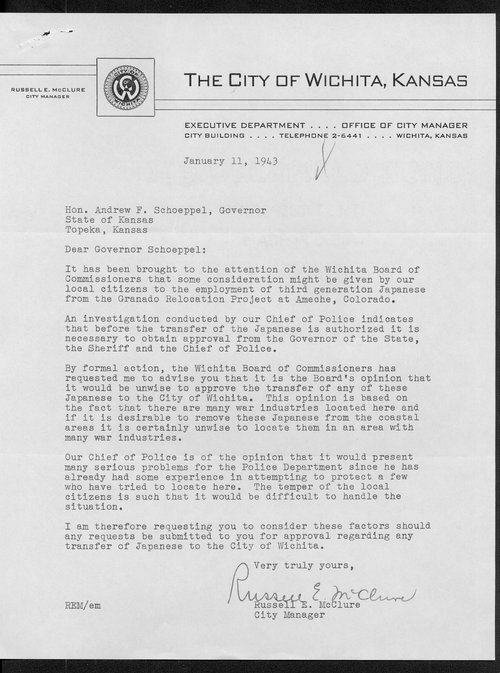 In this letter to Governor Schoeppel, Russell E. McClure, City Manager of Wichita, Kansas, explains to Schoeppel that the leadership of the city is against bringing Japanese Americans to Wichita to ease the labor shortage facing the city. In his justification, McClure also cites views of the city's Chief of Police who told him that "it would present many serious problems for the Police Department since he has already had some experience in attempting to protect a few who have tried to located here." As a result, McClure argues that "the temper of the local citizens is such that it would be difficult to handle the situation." This item can be used to introduce students to the difficulties faced by Americans on the home front during World War II, as well as the treatment of Japanese Americans durign the conflict.